As you have probably noticed, the Commonwealth Games are happening in Glasgow just now and the city is buzzing! Here at Plan Bee Ltd, we have been recognised for its contributing to the local community in the host city through our School Legacy Project. 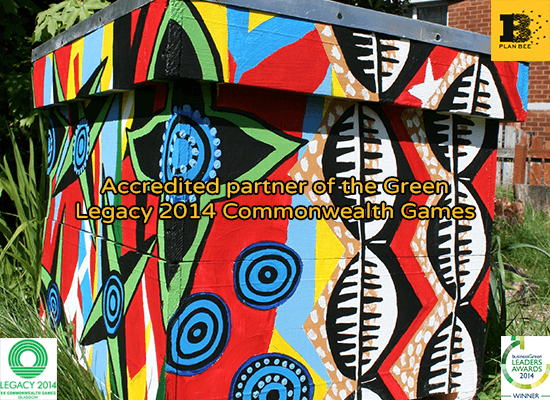 We recently introduced our Commonwealth beehive designed by Lourdes Secondary School but we also wanted to show you some pictures of beehives and bee-keeping in various Commonwealth Countries. Today, we would like to present bee-keeping in Uganda! 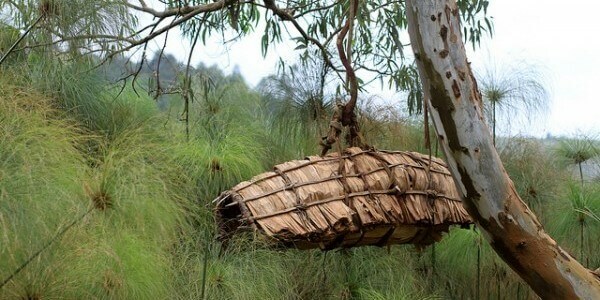 Beehives like this are traditionally constructed from timber, bamboo or woven from forest climbers and honey is usually harvested twice a year between March – June and the secondary season in August – October. 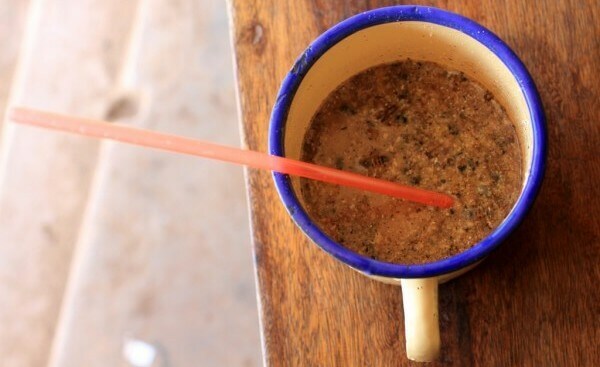 Bee-keepers produce honey and other bee products such as a brew named “Enturire” (second picture) which is very popular. The straw supposedly helped prevent ingestion of the bees and according to Adam Cohn (www.adamcohn.com), who kindly gave the pictures, the brew was actually pretty tasty! We really enjoyed her enthusiasm, positivity and input to the team and we wish her all the very best for the future. Presentation of our first Commonwealth beehive! We couldn’t find a better way to welcome the Commonwealth countries in the Glasgow Commonwealth Games than presenting our first Commonwealth beehive made and designed by the pupils at Lourdes Secondary School in Glasgow! What do you think about it? We are delighted to see that Plan Bee have been featured in different magazines this month! 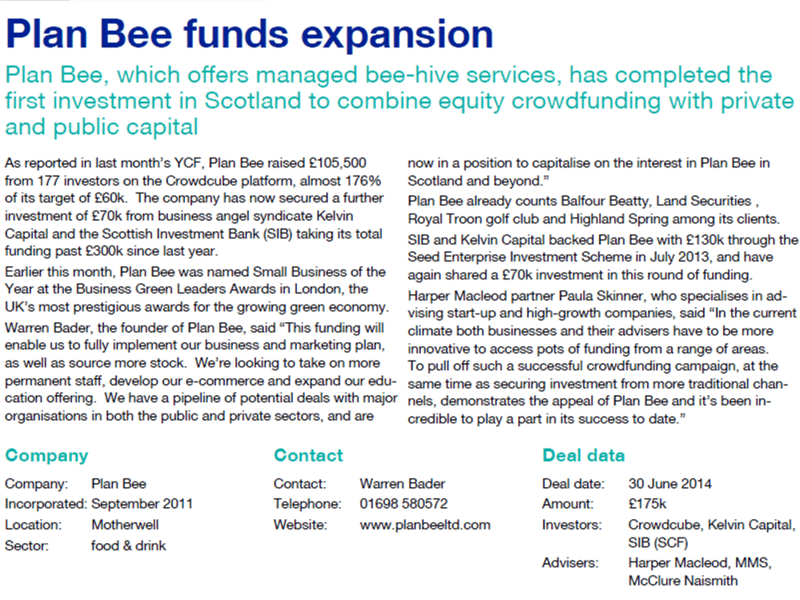 Young Company Finance Scotland highlights Plan Bee as being the first investment in Scotland to combine equity crowdfunding with angel syndicate investment and public capital. 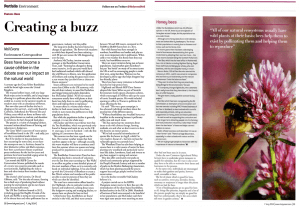 Holyrood Magazine features Plan Bee as well in its Environmental section and emphasises that the decline of our pollinators, particularly honeybees, has become a cause célèbre in the debate over our impact on the natural world. We really appreciate the recognition from them and hope that these articles will raise awareness about the importance of our honeybees! 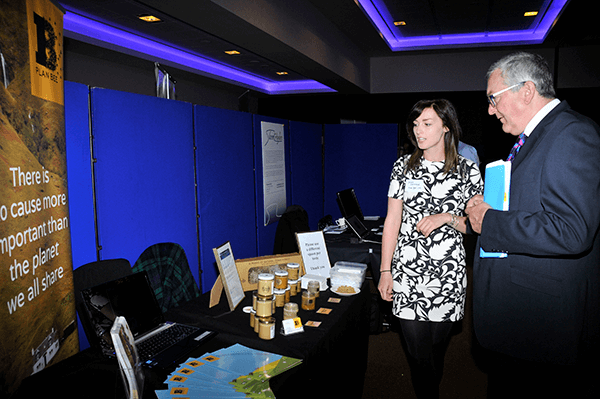 Recently Jenni attended the Scottish Environmental Technology Network‘s 8th Annual Environmental & Clean Technology Conference (SETN) and met Fergus Ewing, the minister for Energy, Enterprise and Tourism. The conference aims to bring together the cream of Scottish innovators and facilitators, creating market, collaboration and investment opportunities. 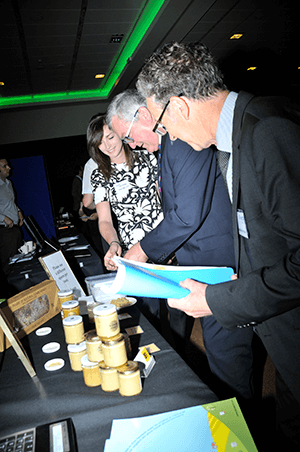 Having attended the conference in previous years, Plan Bee have always found it to be an excellent opportunity to meet with like-minded individuals in the Eco-Innovation sector. This year’s conference did not disappoint; packed with interesting and informative presentations from a wide range of speakers on topics such as eco-innovation funding and investment for innovation. Plan Bee have been short-listed for the Nectar Small Business Awards in the “Contribution to the Community” category! Watch this video (3 missions) to see our contributions to the planet and the community, as well as our help to organisations who want to make positive natural impacts in their local environment. Lanarkshire based eco-innovation business Plan Bee was named Small Business of the Year at the Business Green Leaders Awards in London on Wednesday evening. Now in their fourth year, the BusinessGreen Leaders Awards are the UK’s most prestigious awards for the growing green economy and celebrate the leading businesses, executives, entrepreneurs, investors, and campaigners from across the green economy. The awards cover every aspect of the green economy from transport to energy and from small businesses to multinationals, providing organisations of all sizes with the opportunity to highlight how they are contributing to the new green economy. “We are delighted to have won this prestigious award in what was a very tough category with some of the best small businesses from around the UK. It has been a rollercoaster journey from the beginning but it’s great to have national recognition of our achievements”. 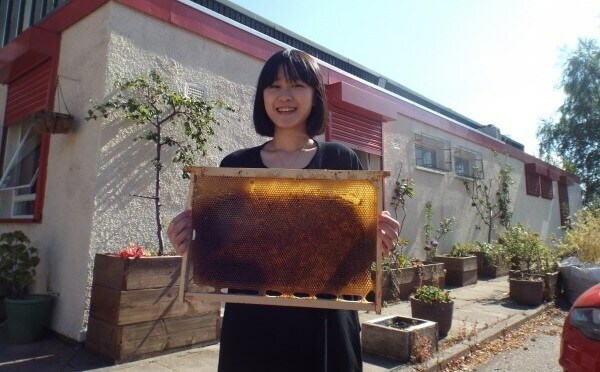 Fresh from being named the UK green economy’s Small Business of the Year, the groundbreaking eco-innovation business which offers managed bee-hive services, has created a buzz by pulling off one of Scotland’s most successful crowdfunding campaigns as part of a second funding round which also attracted backing from the public and private sectors. Advised by law firm Harper Macleod, the start-up raised £105,500 from 177 investors on the Crowdcube platform, almost 176% of its target of £60,000. 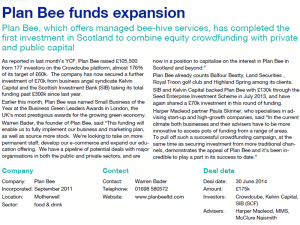 Added to further investment of £35,000 from Glasgow-based business syndicate Kelvin Capital – matched by the Scottish Investment Bank (SIB), the investment arm of Scottish Enterprise – it takes Plan Bee’s funding past £300,000 in total since last year. This is the first time in Scotland that a business has utilised funding from crowd investors, angel syndicate and public sector investment making this a unique deal within itself. 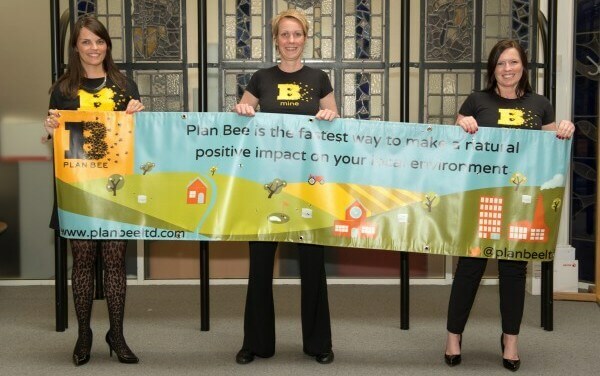 Plan Bee Shortlisted for Nectar Small Business Awards! Today we were delighted to discover that we have been shortlisted for the Nectar Small Business Awards in the “Contribution to the Community” category! Nectar Business is the UK’s leading loyalty programme for small business owners and have been “giving back” to businesses since 2005. The awards provide a fantastic opportunity to raise the profile of small businesses within the UK and highlight their achievements. Star of The Apprentice and leading UK businesswoman Karen Brady chairs the judging panel alongside Will Shuckburgh, Managing Director at Nectar. The winner of this prestigious award will be decided by public vote so we need you to get behind Plan Bee and vote for us by following the link below! Voting closes on 27th July so don’t delay!